Dr. Ben Roberson has been an educator at the Elementary, Middle School, High School, and Collegiate level for the past 12 years. After completing his undergraduate work at Point Loma Nazarene University, Dr. Roberson completed his teaching credential at Chapman University and began his teaching career at Maranatha Christian Academy in Orange County. Dr. Roberson joined the Bible Department at Oaks Christian School in Westlake Village and taught courses in Old and New Testament. Duringhis years at Oaks, he also served as the Head Women’s Tennis coach at California Lutheran University while completing his Masters degree in Physical Education at Azusa Pacific University. 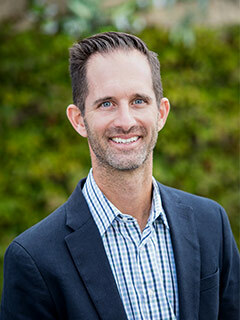 With a desire to pursue leadership, Dr. Roberson completed his Masters degree in Educational Leadership and Administration at Pepperdine University before taking on the Dean of Students role at Pacifica Christian High School in Santa Monica where he also has taught courses in the Theology Department. As the Dean of Students, Ben led a variety of programs including college counseling, academic support, and weekly chapels. Dr. Roberson furthered his academic pursuits by completing his Doctorate at Pepperdine University in Educational Leadership, Administration, and Policy. He completed his dissertation on the motivation towards learning perceived in Socratic Seminar vs. traditional lecture in High School level students. After completing his doctoral coursework at Pepperdine, Dr. Roberson took on the role of Head of School at Calvary Christian School in Santa Ana. During his years at Calvary Christian School, Dr. Roberson served to strengthen the academic reputation through effective faculty development resulting in significantly increased test scores in mathematics, reading, and language. Dr. Roberson also serves as an adjunct professor at Pepperdine University where he teaches courses in Secondary Methods, Content Methods for History, and Human Development. Dr. Roberson returned to the Pacifica community in 2014 when he was named founding Principal for the Orange County campus. Ben, his wife Cassidy, and their children, Griffin and Peyton, live in Huntington Beach where they attend Rock Harbor Church. Ben enjoys surfing, tennis, reading, and spending time with his family during his free time.